Anthony first came to Singapore with his then-girlfriend-now-wife in early 2012. While she stayed on in Singapore after receiving an offer for the position of an engineer, he returned home back to the Philippines. He came to Singapore again in December the same year and joined Huber's as a butcher. It seems there was a trend of making friends over Short Message Service (SMS) in the Philippines years ago. Your friend passes your mobile number on to someone of the opposite gender who then texts you on your mobile phone to 'make friends'. This is how Anthony got to know his wife: they texted each other on the phone for about three months before deciding to meet in person. They then dated for about six years and married two years ago in Singapore. Anthony's wife works shifts. Due to the nature of her work, both of them take turns to cook: she cooks on her off days and he cooks on his off days. Some time ago, Anthony's favourite food was chicken rice and he claimed to have eaten it almost everyday! Now? His favourite is Thai and Japanese food. Two things Anthony would rather not eat: offals and curry (he likes Thai curry though). 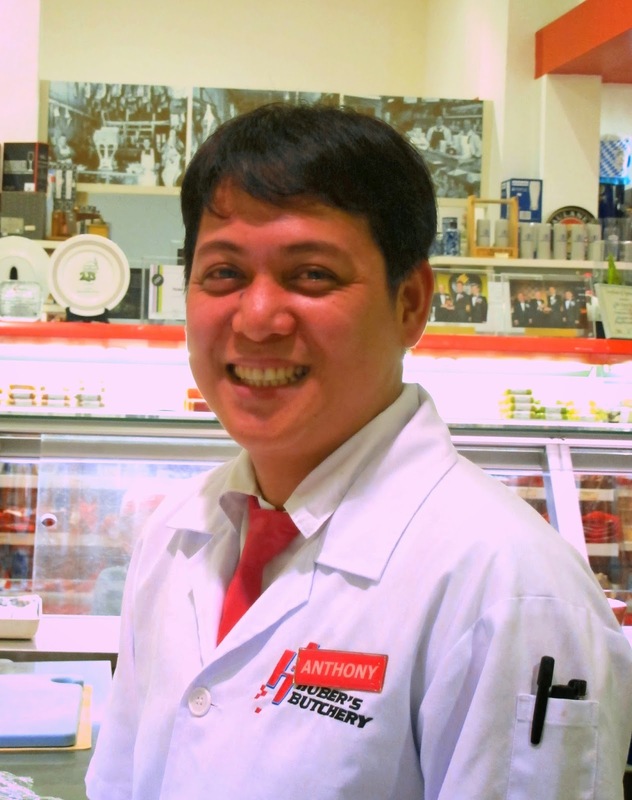 Usually seen behind the butcher's counter at the cold-cuts area, Anthony dreams of leading a simple quiet life with his wife and 2 children in future.